Making A Mark gives an insanely talented artist some IADW brag-space. 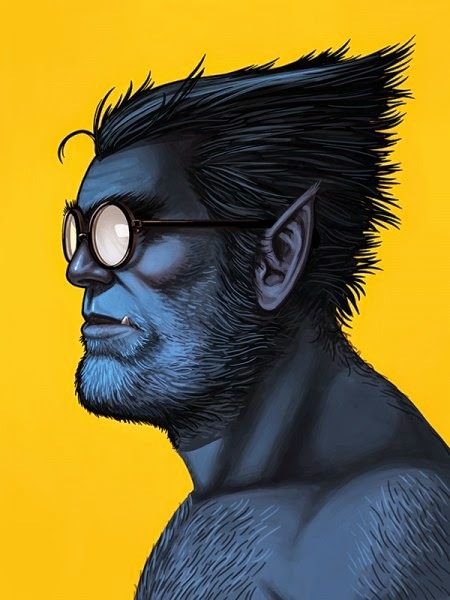 Today goes to Ant Lucia, an artist who has taken headshots of Marvel's A-listers, right back to the C, and given them portraits worthy of royalty. Light on backgrounds and detail, yet strong on colour, clear lines and character, let's kick this post off with the elf. “My love for Marvel Comics was an integral part of growing up. Not just the comics, but the action figures, video games and cartoons. My intention with this show was to take those characters out of their action-oriented world and give them a moment of silence to catch their breath. There are a number of flashbacks and "I remember when's" when you flip through Mike's collection. Buy following Mondo's Twitter or website, you can even see when each is for sale, to the public, should you want Colossus or Doctor Octopus on your walls.